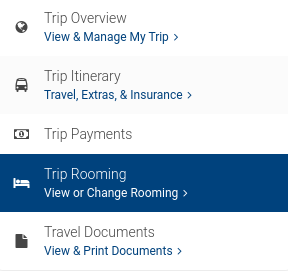 Once you sign into your online profile, click the “Trip Rooming" section on the left-hand side of the screen under My Trips. Click the orange box that says "Request a Room Type or Roommate Change". 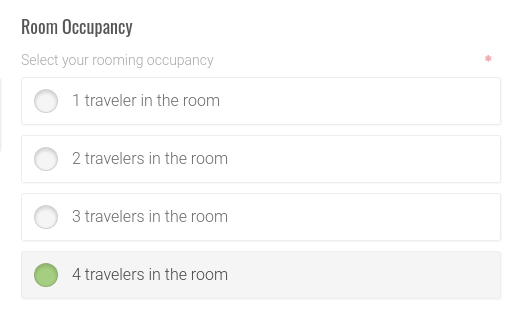 You'll select the room occupancy that matches your request, and click "Yes, I know who my roommates are". Remember that the trip price is based on occupancy, so your price will change depending on how many people are in your room. You'll then need to enter the names of each of the roommates you are requesting, and click "Submit rooming selection". The request will be added to your file, and we will review it shortly after. Make sure that all of the roommates you are requesting log on to their profiles and submit the same request. The request must be mutual for it to be approved. Make sure to submit your requests before the deadline, and keep in mind that you are not able to add roommates when your trip status is Pending. Please catch up with your payments and contact our office to update your status as soon as possible. Not sure who you want to room with? Review this article: Will Breakaway Tours randomly assign me a roommate? If you are signed up for a trip to Mont Tremblant, rooming works a little differently, and you will not be able to submit a rooming request through your online profile. Review the article here for more information: What is different about rooming for a trip to Mont Tremblant?